Pretty much my favorite thing in the world is a new picture book. I love looking through book lists and maxing out my library holds with all the new releases (if you’re curious where I find recommendations for new books, here are my best sources). But then there are those picture book gems that instantly become a favorite and we read them so many times I know we should add a copy to our home library. 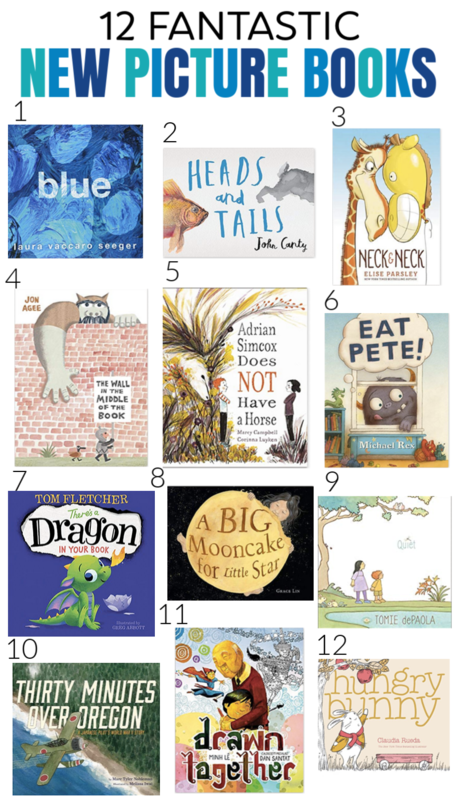 These twelve new children’s books have all been released in the last few months (some as recently as last week!) and every one of them is terrific. I hope you’ll like them as much as our family has! Her book Green has long been one of my very favorite picture books and I couldn’t wait to crack open this one. I love her clever way of exploring all the shades of one color and all the different ways the name of a color can be used. Done in beautiful watercolors on striking white backgrounds, this book shows just a bit of an animal and then gives clues – can you guess what animal you’ll see when you turn the page? (This book actually doesn’t come out until next week, but it was too good not to include here). Leopold the giraffe is a beloved feature at the local zoo. He loves his steady stream of visitors. But when a little boy appears with a giraffe balloon, he feels deeply threatened. Isn’t a real live giraffe better than a balloon? There might be nothing to do but take on this enemy. There’s a wall running through the middle of this book and the young knight on one side is SURE that it’s the only thing protecting him from a tiger. No, a rhino! No, an ogre! It turns out that what’s REALLY on the side of the wall might be the only thing that can save the knight. Adrian won’t stop talking about how wonderful and beautiful and amazing his horse is. Which would be annoying enough, except that Chloe is CONVINCED it’s also a lie. How could Adrian have a horse when he eats free lunch, has holes in his shoes and lives in a tiny house with practically no yard. Chloe’s mother listens to her complaints and then they go for a walk together where Chloe learns that she’s right. And that’s she’s also wrong. When a monster climbs into Pete’s room, he only has one thing on his mind. Eat Pete. But Pete keeps suggesting fun new games to play together. Is it possible that the monster WON’T eat Pete? If your child loves interactive picture books like Press Here (and what child doesn’t? ), they’ll love this companion book to There’s A Monster in Your Book, where a dragon egg hatches on the page and the baby dragon wants to PLAY! But a fire-breathing dragon, no matter how little and cute, can also be trouble! I love Grace Lin (we are huge Ling & Ting fans here) and her new picture book is completely stunning. A mother make a big round mooncake and each night, Little Star sneaks in and nibbles away a bit of it until a month has passed and the mooncake is gone. Of course, it follows the cycles of the moon, so it’s a fun introduction to that topic, but it’s also visually beautiful. Is it ever a bad time for a new Tomie dePaola book? This one, with his super recognizable illustration style, follows a grandfather on a walk with his two grandchildren. Together, they take a few minutes to slow down and just be still. It’s one of those books that you read and then take a deep, calming breath afterward. It’s just so sweet. I’d never heard this story about a Japanese pilot who bombed Oregon during WWII not once, but twice (the only time the U.S. mainland was attacked during WWII). The bombs made little impact and the pilot didn’t tell his family until decades later when he was invited to one of the Oregon towns he’d tried to destroy. Despite his fears that it’s a trick, he make the journey back to the United States. It’s really well-done, with beautiful illustrations and makes a great way to talk about forgiveness and putting aside differences. (Note that this one has a reference to seppuku, which is traditional Japanese suicide by someone consumed by shame). You guys. This book. 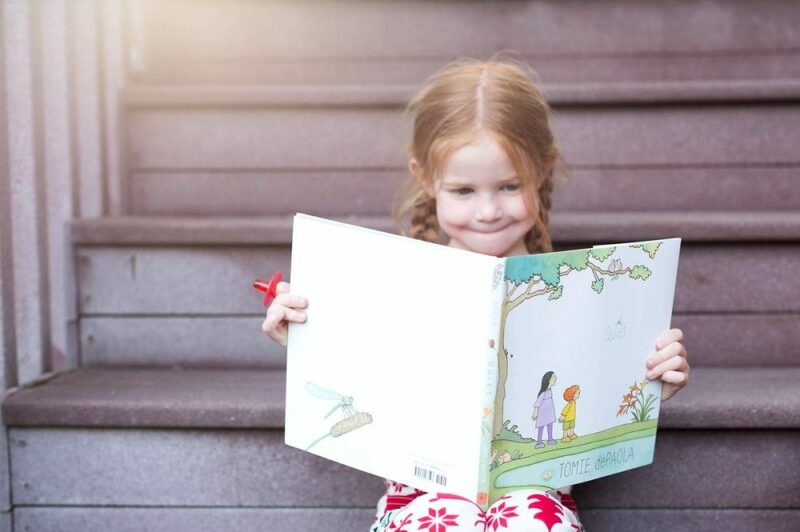 It’s nearly wordless (if you struggle with wordless books, here are a few suggestions for how to read them with your child! ), beginning with a young boy coming to spend the afternoon with his grandfather. Their differences, including a language barrier, couldn’t be more stark, until they discover how much they both love to draw. I LOVED her book Bunny Slopes a couple of years ago and it’s been a staple in our rotation since it was released, so I was thrilled to see a companion book come out this fall with the same lovable bunny. But this time, he needs help picking apples. There is a red ribbon bookmark attached to the book and it’s cleverly used in this book as an interactive tool. What new children’s books are you loving lately? I think I need to get a library card for my baby because my 5 year old’s 5 holds are constantly full (and of course my 5 are as well). There are just too many picture books I want to read with him, starting with all the ones you recommend! Tomie DePaola and Jon Agee are two of my all time favs. I love DePaola’s picture books, but his 26 Fairmont Avenue series just so very special. I come back to again and again with my kids. The audio book is even better–and read by Tomie himself! We listened to it on a long car trip with my parents and at the end, even my parents wanted me to drive around the neighborhood a little longer so we could finish. We’ve recently loved The Dress and the Girl and – I’m not sure if it’s new, but it’s great – Sergeant Reckless!